When it comes to finishing a woodworking project, sanding is always part of the task and in most cases the most important part and also unavoidable. In its simplest form, a piece of sandpaper and some elbow grease is all it takes. However, the power sanders do a much better job and they are also way much faster and more efficient. Getting the best sander for your projects will require you to first understand that they come in different types. From the belt, orbital and random orbital to palm, drum and detail sanders, each is ideal for certain situations and will have both advantages and disadvantages. These different sanders will also differ in many other factors besides the type such as power, speed, and portability. Regardless of the type of sander that you choose to buy, the most important thing is to ensure that it works effectively and saves you some time. This piece provides more information on some of the most common sander types, their benefits, and disadvantages to help woodworkers make an informed decision on what to buy. A sander might be an essential workshop tool but it will only serve you well if you get the right one for your projects. Finding the best type of sander for your projects will require you to know the pro and cons of some of the most common ones available in the market. When you want to sand large flat surfaces the belt sander is always one of your best options. Belt sanders are some of the most common types of sanders and almost a must-have for many professional woodworkers. These sanders will feature a section of sandpaper that is in most cases 3 or 4 inches wide stretched over rollers, and they can tackle larger sanding jobs quickly. The size of the belt is one of the main factors that determine what you can use the belt sander for. However, the speed also matters, and for most belt sanders it will range between 900 and 1,600 feet per minute. You can get belt sanders that weigh anywhere between 2 and 10 kilograms and some can be attached to a workbench to provide ease of use. And although they are also quite versatile, they are best for tasks like sanding tabletops and doors, removing old paint and sanding uneven areas such as wood flooring edges. Belt sanders will sand larger areas and uneven stock fast but they are not ideal for pieces that require a smooth or sparkling finish. The relatively affordable Skil 7510-01 is an easy-to-use sander that almost any woodworker can handle effectively including the beginners. It uses some impressive technologies to improve the sanding experience and they include the pressure control technology that alerts you when you put too much pressure. And there is also an auto track system to ensure that the sanding belt always remains centered on the track. Skil 7510-01 is one of the best belt sanders when it comes to dust management. It comes with an efficient micro-filtration that will capture and contain the fine dust particles and there is also an attachment for a shop vacuum. Changing the belt is also quick and easy thanks to the single lever belt change design. As the name suggests, the belt-disc sander is modern sanding tool that combines the disc and belt sanders in one machine. It is a powerful sander that comes with both a belt and disc sanding surfaces to make it ideal for a variety of uses. And to simply state it, the best belt-disc sanders will do almost everything that both the belt and disc sander will do individually. These sanders are often large and heavy machines with a sturdy base that helps to prevent vibrations, and they are a great choice when you have a dedicated spot in the workshop for them. Some of the most common application of these types of sander are sanding surfaces to prepare them for varnishing, removing hardened glue or rust and also smoothening patches on wooden workpieces. However, it is also important to note that despite their versatility these tend to be large and heavy sanders that may require you to dedicate a permanent spot for them in the workshop. 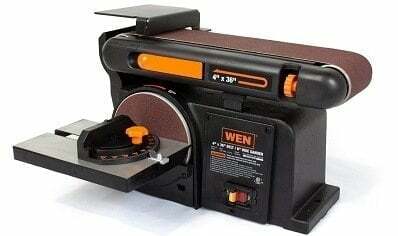 When you need both a belt and disc sander but do not have the resources to buy both as separate tools the Wen 6502 will be an excellent buy for you. This belt-disc sander comes with 80-grit belt and disc, and with a 0 to 45 degrees beveling work table to make it even more versatile and easy to use. The belt on this sander is also quite convenient to use as you can tilt it from a horizontal to vertical position or any other angle between the two. And this makes it highly useful for various projects. This sander also runs on a powerful 4.3-amp motor that delivers a speed of up to 3,600 RPM and with a sturdy cast iron base to minimize vibrations. Sanding curves and other unique shapes and angles can be a daunting task with the regular sander that you have in the workshop. Something with a more unique shape and design like the oscillating spindle sander is what you need to sand angles and curves. Oscillating spindle sanders are dual purpose sanders affixed and protruding from a base. And depending on the size of the sander that you buy, they can also be portable and easy to move from one job site to the other. When working the spindle with the abrasive sleeve will oscillate up and down and in a circular motion, and you have to move the plane of the wood gently against it for sanding. These sanders are also great for sharpening and polishing applications, and with the right abrasive sleeve, you can also use them to sand metal. Wen 6510 is designed to ensure that woodworkers never have to sand round pieces by hand. And it runs on a relatively powerful 3.5-amp motor that will deliver speeds of up to 2,000 RPM. This sander will work even with the most oddly shaped pieces, and this is what makes it one of the best oscillating spindle sander on the market. It will come with six 80-grit sanding sleeve sizes which is what makes it ideal for various curvatures and there is also an onboard storage for the accessories. Dust management is also easy thanks to the collection port that allows you to hook in a dust collector. Random orbital sanders are the most popular type with both DIYers and professional woodworkers and many people like them due to their versatility. These sanders are flexible, affordable and relatively easier to use than most other types and they often act as a bridge between the belt and orbital sanders. This sander gets the name "orbital" from the sanding disk action and "random" from the elliptical motion the disk will make in addition to the orbital movement. And since these sanders are circular, they will allow you to work into awkward spots or hard to reach corners with ease. Changing the sandpaper and keeping it in place is also easy with the random orbit sander as they use a hook and loop system. And their orbital action will allow for fast and clean sanding with no scratches or swirl marks. Black & Decker BDERO100 is the cheapest item on our sander reviews but despite the highly affordable price tag, it is still one of the most versatile. Like most other random orbit sanders, it uses a hook and loop system to make sandpaper changes quick and easy and the switch is dust-sealed to keep dust and debris out. This sander is also compact, ergonomic and highly versatile and every DIYer or professional woodworkers will find it very useful to have in the workshop. Its overall lightweight construction also makes it one of the best portable sanders on our list and also makes it easy to maneuver when sanding. The palm or finish sander will feature a square pad that will move in small and circular orbits. It is a great finishing sander that creates ultra-smooth finishes and will be very useful when sanding corners. This sander is a popular choice for beginners and it holds small square sandpapers that come in various sizes. And it uses spring-loaded clips to hold the sandpapers in place. When you compare this sander with other common types, it is relatively quiet and lightweight and it is also much easier to control. Besides the usual sanding applications, the palm sander is also ideal for smoothing paint, plaster or varnish and it will work great for plywood and fine veneers. If you are on the hunt for the best sander for your finish sanding the Makita BO4556K is an excellent choice. This sander will produce up to 14,000 OPM to ensure fast and smooth sanding. And it also works with minimal noise and vibration thanks to the all-bearing construction. Sanding is also a comfortable and less tiring activity with this sander as it comes with a contoured and rubberized grip that helps to increase user comfort and provide better control. The large clamping lever is also a great addition to the design as it makes paper changing quick and easy. And the on/off switch is conveniently located to allow for easy one-handed operation. A stationary drum sander is a versatile tool that will be useful for everything from smoothing narrow strips to wide boards. And besides its ability to smooth various material sizes, the drum sander also produces consistent thickness. Drum sanders will be very useful when you want to level or smooth already assembled cabinet doors. These sanders are also great for maintaining square edges and tend to work quickly and efficiently. You also get to choose from several variations of the drum sanders. The most common types are the single drum with open end design which takes up little space and the more powerful single drum models with closed ends. The Sandsmart control is one of the highlights of the JWDS-1632 as it will continuously monitor the load on the motor, and adjust automatically to ensure optimal feed rate without resulting in an overload. Also, adjusting the parallelism on this drum sander is quick and easy as you will only need to turn the dial which also has a stop that can quickly return the conveyor bed to a flat position. With this sander, you also never have to push the workpiece as it will pull it through the sander to speed up the sanding process. The infinitely variable speed is also a great addition to this drum. And it also comes with a dust hood designed for optimal extraction of sanding dust. This is also a highly durable drum sander thanks to the reinforced steel conveyor belt and the die-cast drum carriage. The detail sander is similar to the palm sander but with a triangular-shaped base plate that allows for easy navigation of more awkward shapes and for sanding into corners. With the detail sander, awkward sanding jobs like window frames, slots and grooves are much easier and quicker. This lightweight but quite a noisy power tool is one of the best all-purpose sanders among the various types but it will not be very useful for heavy stock removal. Some models of the detail sander will also take extension plates, scrapers and cutting blades to make them more flexible. And many will also come with interchangeable pads. The relatively affordable price tag, compact size, and ease of use combine to make the Black & Decker BDEMS600 one of the best details sanders out there. It comes with the finger attachment and sanding pad to ensure you have everything you need for immediate sanding and it will fit into tight spaces easily. This sander comes with a 3-position grip for control and ease of use and its 1.2 amp will deliver up to 14,000 OPM for fast material removal. The detail finger attachment is handy for the hard to reach places and the compact body with some low-profile legs for quick and easy maneuverability. Dust management is also catered for in this detail sander as it comes with a high-performance dust collection and a microfiltration system. If you are a professional woodworker or even a hobbyist or DIYer that does a lot of woodworking the chances are that you will need to have more than one type of sander in the workshop. But, regardless of the types that you choose to buy from the 7 above and the few other types on the market, it is important to make sure that you get the best quality. And for this to be so, you need to consider the following things when shopping for a sander. Power should be at the top of your mind when shopping for a good sander as it determines the performance and convenience of using the tool for your woodworking projects. Sander will range from the small units that are not very powerful to the large benchtop models that produce a lot of power. The right one for you depends on the tasks that you want to use it for but if you can afford it, the right idea is to have both small and portable models and also the large and more powerful ones. When it comes to power you will also need to choose the source of power and in most cases, the options are electricity, batteries, and air compressor. Battery-powered sanders are the most portable as you can use them from anywhere provided the batteries are charged. The pneumatic ones, on the other hand, that are powered by air compressor are the most powerful and fastest. The speed of the sander determines what you can use it for and also how fast you finish the task. Some inexperienced woodworkers tend to assume that the best sanders are ones with the highest speeds but this is not entirely true. While it is always great to have a high-speed sander, what you should be looking for is one with a variable speed. A variable speed sander will allow you to use the low-speed settings when doing some delicate sanding tasks and for finishing while the high speeds are ideal for sanding larger and rougher pieces. Sanding is always a part of many woodworking projects whether you are doing some home improvement or making furniture. Hence, whatever sander you buy should be comfortable enough for extended use. The best sander for woodworking is one with an ergonomic handle that is comfortable to use for extended periods and with minimal hand fatigue. Also, it should feel well-balanced in your hands and with minimal vibrations to ensures that you can use it comfortably as this also determines the outcome of your projects. Although almost every woodworking task will produce some wood dust, very few if any at all will produce as much as a sander. Regardless of the sander type that you are buying it is important to make sure that it has an efficient dust management system. Dust extraction and collection systems will consist of dust bags, filter canisters and sometimes hoses attached to a vacuum. The important thing is to make sure that the dust collection system on your sander is efficient, convenient and does not require regular emptying. The sander is one of the tools that you will end up using a lot and so you will need some assurance that it will serve you for long enough. While most brands will claim to make the highest performing and most durable sanders, a warranty is in most cases your only assurance that you are getting a high-quality tool that will last long. 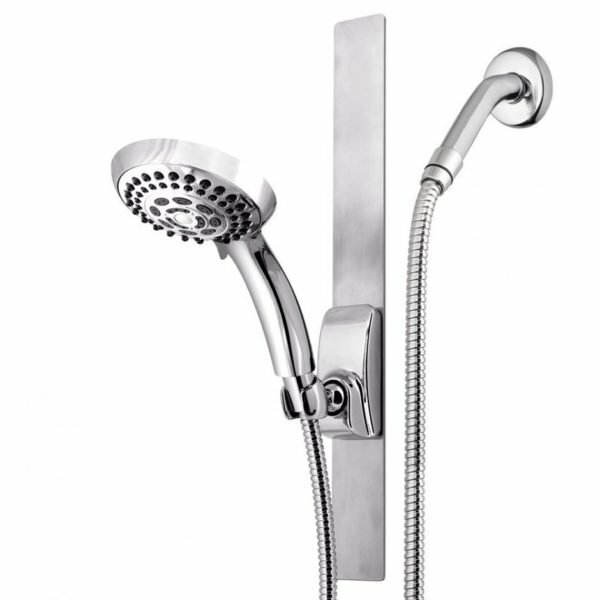 Some of the best sanders from leading brands can come with a warranty of up to 5 years but on average most will be backed by a 1-year warranty which is still quite good enough. A sander is a crucial tool for finishing your woodworking projects as it helps to prepare the surface for stain or paint. And so it is always important to make sure you get the best ones. Finding a good sander will require you to know the different types and what each is good for and consider features like power, speed, and grip. With this information in mind and by taking time to compare the different types and brands, you can be confident of finding a sander that will be very useful for your projects.